I'm not entirely sure what category this belongs in actually, but I figured Other Seiyuu/J-pop is close enough. I found the scan accidentally while looking for the chords to City of Delusion and came across scans of the official BH&R guitar book at Microcuts. Since I have an artblock, I figured I should do something different and vector it. It was a pdf, so I took a screenshot and then edited it in photoshop to bring out the blue tones in an attempt to balance out Dom's shiny blue tie. So... this was painful. Mostly from computer lag. It isn't finished, as I meant to vector all of Muse, but by the time I finished Matt and got halfway through Chris it took almost five minutes just to do any single thing (like say, zooming in, or switching from the pen tool to the select tool) My patience for vectoring is already near nonexistent, and it's a miracle I got as far as I did anyway. So I decided to submit it as just Matt, and maybe if I ever get my hands on a faster computer I'll finish it completely, but 'till then, this is all. After I decided to keep only Matt, I added the green glow outline thing to balance out the composition. It was originally meant to be all shadow and Matt's silhouette would've been shown against Dom. So yeah, this was extremely trying on my patience and laptop, but I went through it anyway because I just love Muse so much. :D I'm still not entirely happy with the hair, or the suit. But I'm pretty proud of this anyway. Yay...I love Muse...they rock...I didn't know how they look,though...nice work! Wow, amazing job! 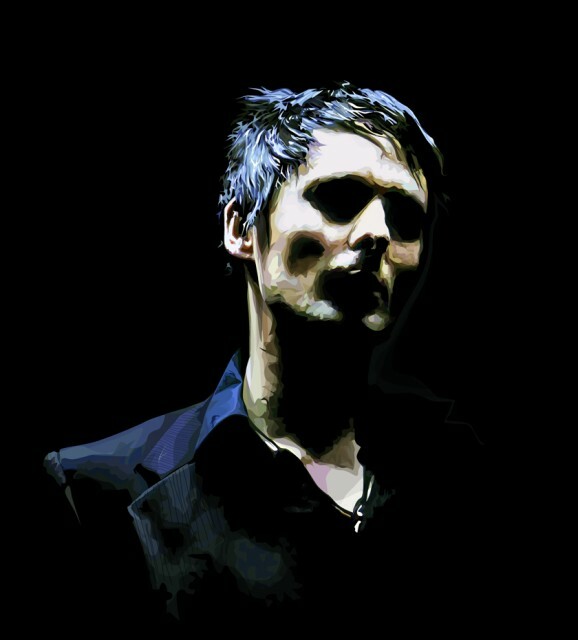 And Matt is <3 (though I can't say that I'm a HUGE huge fan of Muse, but I do enjoy some of their tunes). I'm amazed that you actually had the patience to vector that. Bravo! I think it looks classy. Great vector. nice vexel, I like the different tones you used in his skin, and did it kinda blocky instead of smooth. Did you adjust opacities or use blend modes, or is it just straight changing colours? I like his hair too (I find hair the hardest to vexel, so what's your secret? XD), esp the bright colour against the black background. Amazing :o The colors are just stunning. The bright blue on the dark background is so beautiful. Great work!